Defining the term “professional volunteerism” is tricky. The word “professional” could mean someone who gets paid for doing a job, whereas the word “volunteerism” means performing work without getting paid. Thus, the term “professional volunteerism” might sound like an oxymoron. However, the word “professional” also means having an exceptional skill and mastery at something. Referring to the latter definition, “professional volunteerism” could be understood as the act of implementing high level of skills, mastery and work ethics in doing unpaid work. Professional volunteerism usually takes place at nonprofit organizations which mostly rely on volunteers to operate. It is done by preparing volunteers with necessary skills and knowledge to make sure volunteers are ready to contribute positively to the community they work with, instead of doing harm. By developing professional volunteerism, a nonprofit organization could maintain the quality of their programs, as well as developing a strong base of skilled volunteers who hold crucial roles in helping the organization achieve their goals. It enhances the quality of service they give to people or community they work with, and gain better trust from donors and sponsors. Professional volunteerism helps to ensure program sustainability in the long run. Professional volunteerism is developed by well-managing the projects and activities where volunteers are involved. The organization is responsible for fulfilling the volunteers’ need for support during their volunteering time and making sure that volunteers are appreciated for their contribution. The ongoing problem commonly found in volunteer-based social work is disorganized volunteer management. Some organizations depend completely on volunteers’ good intention to show up now and then without any clear commitment. It is good to facilitate the volunteers’ time flexibility, but besides being ineffective for the program, volunteers will feel disengaged and lose interest over time. It motivates them more when volunteers gain a sense of meaning and accomplishment from the program and are recognized by the organization for their significance. It is necessary to make a distinct agreement about commitment, responsibilities, and benefits that occur to both parties during the volunteering process. Training and orientation sessions are essential to make sure volunteers are ready to face the challenges as they dive right into the field. When given the right support and treatment, volunteers will be willing to go the extra miles and help achieve a bigger impact. Professional volunteerism also helps volunteers to grow professionally and benefits the volunteers in many ways. Firstly, it lets you practice your professional skills. When you choose to volunteer specifically in the field of your expertise, it gives you hands-on experience and develops your skills set. You can even acquire new skills and have more freedom to experiment in the relatively low-risk environment. This is especially beneficial for college students and fresh graduates who need opportunities to kick-start their career and increase their future employability. Secondly, you will get a chance to expand your networking. You will get to know people from various backgrounds who share the same views and beliefs as you. You can even meet influential people or community leaders, people who will widen your perspective about the world and those you can earn knowledge from. Thirdly, you will gain an incredibly rewarding experience. Volunteering can be very fulfilling as you do good for other people and help make a difference. It energizes you and makes you feel less absorbed in your daily life stresses. It also helps for professional workers who want a break from their stressful job, as well as improving their skills while at the same time giving back to the community. After all, professional volunteerism assures you that the time and effort you are pouring is carefully managed to benefit both yourself and other people. 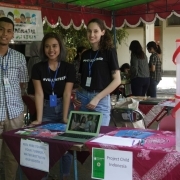 Project Child Indonesia aims to develop professional volunteerism by applying professional management in volunteer involvement. By giving volunteer the proper training and orientation, we intend to reduce the risk of giving harm to the society we work with. We value our volunteers greatly, and we do our best in maximizing our resources to better support our volunteers. We really hope that volunteers will gain valuable experience when working with us, and flourish both personally and professionally. Developing professional volunteerism is also our take on maintaining a sustainable act of kindness. By professionally managing our programs and volunteers, we believe that we are able to achieve bigger and do greater good for the cause.